Why Use A Product Specifically for Bikini Line? A rechargeable electric trimmer kit with 6 attachments for trimming, shaping and removing hair. Comes with bonus exfoliation glove and tweezers - all currently for around $60 online. Cordless and rechargeable, a versatile 5 piece body and bikini groomer set, complete with zipped storage bag. Good value for money, currently at just under $40 online. Multi-use shaver including a precise shaver head and precise trimmer head, ideal for bikini shaving and trimming. Good all in one device available online at just around $33. Shaped and angled small head with pen-like design for easy manoeuverability. Comes complete with comb attachments for even trimming. Available online at just over $20. Battery operated, cordless trimmer and shaver. Convenient and easy to use with trimming combs and storage pouch included. Available for around $18 online. Product has a 5-blade razor head at one end and battery operated bikini trimmer at the other, with adjustable 4 length trimmer comb. Great value for money at just around $11 online. If you just want a simple, wet shave, disposable razor, these are a specially designed shape with small razor head to make shaving down below easier. In packs of 3, 2 packs for just under $8. This fully rechargeable, cordless use, waterproof device is convenient for use anywhere and comes with Philips' 2 year warranty and 45 day money back guarantee. The six attachments include precision trimmer for bikini trimming, comb with 5 length settings and micro shaver with hypoallergenic foil as well as a mini epilator head, eyebrow trimmer and comb. This device has everything you need for delicate bikini and eye areas where careful and precise grooming is required. You can get one hour cordless usage from a full charge (10 hours) - plenty of time to cover both areas in one session. Included with this product is a bonus, beauty package of illuminating tweezers and exfoliation glove plus zipped travel bag with space to store the whole lot. This would make a lovely gift, available for $60 online now. The Remington WPG4050 is a 5 piece grooming kit which is fully rechargeable, for cordless use. It is 100% waterproof for use in or out of the shower. The compact size makes it convenient for use anywhere, especially when travelling. The kit includes an angled, narrow shaver head attachment with hypoallergenic foils for a close shave, a dual-sided bikini trimmer, clip on adjustable length guide (3 lengths) and rotating exfoliator attachment. Complete with zipped storage bag, everything you need for body grooming is included. I found the shape of the trimmer and shaver heads really easy to use and perfectly designed for following the contours of the skin. A good all-rounder for your $39. This multi-use lady shaver has everything for shaving face, arms, underarms and legs as well as having precise shaver and trimmer heads, ideal for bikini area. It is rechargeable for cordless use, giving up to 70 minutes usage from a full charge (8 hours). In addition to the standard, hypoallergenic foil shaver head, precise shaver head and bikini trimmer there is a facial cleaning brush head for deep cleansing/exfoliation. The device is waterproof for wet or dry use and has a charging cradle or can be plugged directly into cable. If you are in the market for a versatile product to suit all your needs, currently priced at around $33 online, you get a lot for your money with this one. This mini, battery operated trimmer/shaver is neat and easy to manoeuver, with the compact design and 90° angled head making it easy to see what you are doing in awkward areas. The device is powered by two standard AA batteries (included). A 5mm click-on trimming comb is included to trim hair evenly. When trimming with the comb you should go against the direction of hair growth. To shave you simply remove the comb and shave with the direction of hair growth. The downside of this product is that, as far as I can tell there is no replacement head available and so when the cutters become blunt you need to replace the whole thing. Having said that, I love the design and it is perfect for travelling as it is so small, light and easy to use. Available at just over $20, so not over-priced. This is a neat little, purpose made device which is operated by two standard AA batteries and which is suitable for wet and dry use. It comes with separate shaver head and two clip-on trimming combs for even trimming to either 3mm or 5mm lengths. A cleaning brush and drawstring storage pouch complete the set. The compact heads of both trimmer and shaver make them easy and precise to use and the ergonomic shape helps with control and comfort. A competitively priced item for what you get, currently available at just $18. The Schick Hydro Silk TrimStyle comprises a razor head at one end of the handle and a battery operated trimmer at the other end. One razor cartridge is included, which consists of 5 blades, skin guards to help minimize irritation and a hydrating strip with shea butter. The razor head measures just shy of 1½" in width and you can purchase replacement cartridges as required. The trimmer is operated by a standard triple A battery (included) and has an adjustable comb with 4 settings for a neat, even trim. The battery is easily replaced by twisting the device at the centre to open and the whole device is waterproof for use in or out of the shower. This is a neat, inexpensive little product, fit for purpose and available online for around just $11. A pack of 4 replacement razor cartridges costs around $13. These disposable, purpose made, no frills bikini razors are surprisingly well designed for the price, to be exactly fit for purpose. The single blade is covered by a protective comb and you can trim or shave the area depending on the angle at which you hold the razor. The narrow ⅝" width of the razor head is perfect for the delicate bikini area and there is a shea butter strip to increase razor glide and reduce irritation. Supplied in a quantity of 2 packs with 3 razors in each for just under $8. It goes without saying that the bikini area is particularly sensitive and prone to irritation from shaving. Also, due to the fact that the hair in this area tends to be coarse and curly, the risk of ingrown hairs increases. Added to this, it can be a particularly difficult area to see and manoeuver properly so that risk of injury, nicks and cuts increases. Shavers designed specifically for the bikini area have smaller heads, often shaped so that visibility is improved and it is easier to follow the contours of the body accurately. Most have moisturizing bars to increase glide and hydration and reduce irritation and are made from hypoallergenic materials, suited to sensitive skin. Bikini combs provide a barrier between blade and skin to trim the hair to varying lengths without danger of cuts and nicks - the shorter the hair is before shaving, the better. Exfoliate Regularly - regular exfoliation removes buildup of dead skin cells and helps keep the hair follicle open and unclogged. Be gentle though - this is a delicate area! Shower - having a hot shower or bath before shaving softens the skin and hair for a closer shave. Trim First - before shaving, trim the hair as short as possible to make shaving easier and reduce irritation. Shaving Cream - use plenty of shaving cream for sensitive skin - keep re-applying if necessary to make sure the blade glides easily across the skin. Taut Skin - make sure you hold the skin as taut as possible with your spare hand to avoid nicks and cuts. 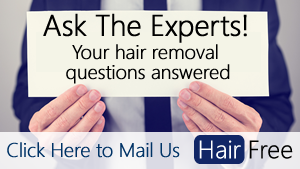 Direction - shave in the direction of hair growth to lessen the likelihood of ingrown hair. Pat Dry - after rinsing, pat dry gently and avoid rubbing. Loose Clothing - wait as long as practicable before wearing tight fitting jeans etc. to give the skin a chance to recover.